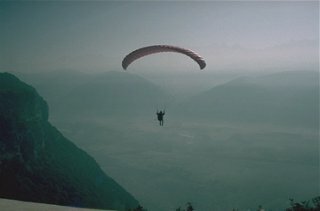 Paragliders launch from a gentle slope and then just fly away. You don't need a boat or have to jump out of a plane. This shot was taken in the French Alps at a well known site with a purpose built take off area. 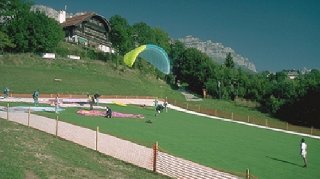 The BHPA are the controlling body for Paragliding in the UK. Their web site has a list of schools and clubs near you. Green Dragons in Woldingham, Surrey. Sussex Hang Gliding and Paragliding near Lewes in Sussex.